Our range of products include honeywell multi gas alert meter, honeywell gas alert extreme o2 detector ( 0-30.0%), honeywell nh3(0-100 ppm) single gas detector, honeywell gas alert extreme co single gas detector, honeywell gas alert extreme h2s(0-100ppm) single gas detector and senko sp2nd h2 gas detector for ups battery room. Gas Alert Meter will simultaneously monitor and display up to five atmospheric hazards. Gas Alert Meter is adaptable to a variety of applications, the Gas Alert Meter has an extensive selection of user-settable field options and is available as either a standard toxic gas model, a PID model for the detection VOCs, or an IR model for CO2 detection. Use the passcode function to prevent unauthorized modifications of the instrument’s settings. Compatible with BW’s Micro Dock II automatic test and calibration system, the Gas Alert Meter is unparalleled in its versatility, performance and overall value. 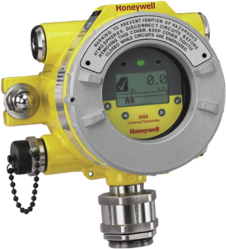 Honeywell Gas Alert Extreme Single Gas Detector Long-term solution Compact and affordable, the GasAlert Extreme reliably monitors for any single gas hazard within its wide range of available toxic gas models. 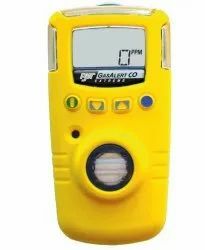 With easy on/off operation, this single gas detector offers extended longevity with a field-replaceable battery and sensor. A wide range of tamperproof user options and multi-language display make the GasAlert Extreme an ideal solution for a variety of applications; plus, datalogging is standard on all units. Calibration is a simple automatic procedure and is compatible with BW’s MicroDock II automatic test and calibration system. Measuring range : 0-30% Vol. 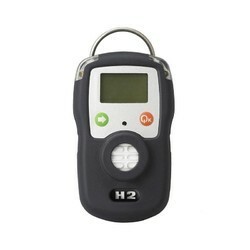 Senko SP2nd H2 Gas Detector is an economical gas detector that can be operated continuously for two years without replacement of gas sensor to protect workers from the disasters caused by the oxygen deficiency or toxic gas poisoning. Applications Battery Rooms, UPS Rooms, Mining, Power supply works, Chemical Industry, Petrochemical Industry etc. Dräger Polytron 5200 CAT is a cost-effective explosion-proof transmitter for the detection of flammable gases in the lower explosion limit (LEL). It uses a catalytic bead Dräger Sensor that will detect most flammable gases and vapours. A 3-wire 4 to 20 mA analogue output with relays makes it compatible with most control systems. Dräger Polytron 8200 CAT is a cost-effective explosion-proof transmitter for the detection of flammable gases in the lower explosion limit (LEL). It uses a catalytic bead Dräger Sensor that will detect most flammable gases and vapours. A 3-wire 4 to 20 mA analogue output with relays makes it compatible with most control systems. 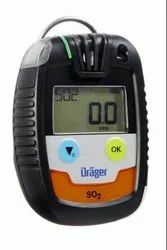 Drager Pac 8500 Dual Sensor Gas Detector is a reliable and precise instrument even under the toughest of conditions. The device can be equipped with a hydrogen-compensated CO sensor or a Dräger dual sensor. This gives you the option of measuring two gases at once: either H2S with CO or O2 with CO.
Dräger Pac 6000 Single Gas Detector is a disposable single gas detection device that measures CO, H2S, SO2 or O2 reliably and precisely, even in the toughest conditions. The robust design, quick sensor response times, and a powerful battery ensure maximum safety for up to two years with virtually no maintenance required. 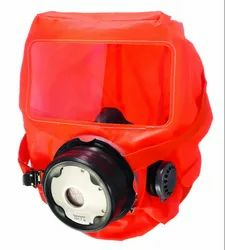 Dräger PARAT 4700 Fire Escape Mask is industrial escape hood was developed with users, placing the focus on the fastest possible escape. Optimized operation and wearing comfort, a robust housing and a tested ABEK P3 filter ensure protection from toxic industrial gases, vapours and particles for at least 15 minutes. 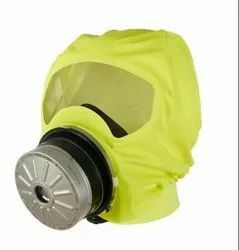 Drager PARAT 5550 Escape Fire Mask is a fire escape hood packaged in a flame-retardant holster. 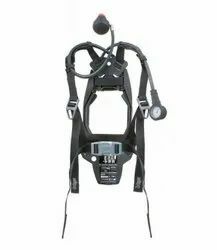 It was specifically developed for fire rescue teams for use in victim rescue. The main advantage is that the system approved together with Drager breathing apparatus according to EN 137:2006. CO P2 combination filter against toxic fire gases, vapours and particles. 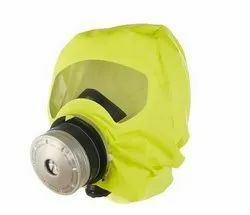 Drager PARAT 7500 Escape Fire Mask is a combined fire and industrial hood developed with users, placing the focus on the fastest possible escape. Optimized operation and wearing comfort, a robust housing and tested ABEK CO P3 filter ensure protection from toxic industrial and fire-related gases, vapours and particles for at least 15 minutes. Drager X-Plore 8000 Powered Air Purifying Respirator offers a new level of intuitive handling combined with intelligent electronics that provide the high degree of safety that people need to focus on the task at hand. Sensor 5 interchangeable and electrochemical sensors. 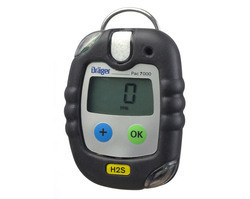 Drager X-am 2500 Multi Gas Detector accurately detecting O2, CO, NO2, SO2 and H2S and is the only one 1-4 gas monitor that we need in industrial, mining and refinery applications. The X-am combines reliable sensor technology with long battery life and intuitive operation in an instrument that defines safety. 5 interchangeable and electrochemical sensors. 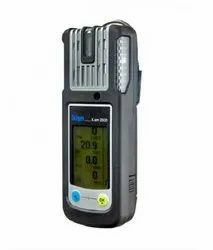 Temp: 20 to +50 °C ; RH: 10 to 95 % r.h.
Drager Polytron 8100 Toxic and Oxygen Gas Detector is top of the line explosion-proof transmitter for the detection of toxic gases or oxygen. It uses a high-performance plug and play electrochemical Drager Sensor to detect a specific gas. Besides having a 3 – wire 4 to 20 mA analogue output with relays, it also offers Modbus and Fieldbus protocol making it compatible with most control systems. Drager PSS 3000 Self Contained Breathing Apparatus is a new generation of high performing breathing apparatus for firefighters. Combining comfort with exceptional pneumatic performance, it is designed for applications where simplicity and ease of use are key essentials. 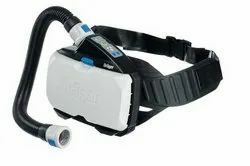 Lightweight yet robust, easy to don, this advanced breathing apparatus provides the ultimate in breathing protection. 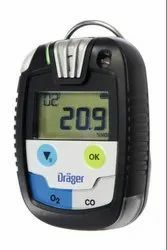 Drager X-am 8000 Multi Gas Detector being 1 to 7 gas detector that detects toxic and flammable gases as well as vapours and oxygen all at once either in pump or diffusion mode. Innovative signalling design and handy assistant functions ensure complete safety throughout the process. 10 to 90% (short-term up to 95%) r.h.
Dräger X-am® 7000 is the solution for the simultaneous and continuous measurement of up to five gases. It is the ideal companion in a variety of applications where the reliable detection of oxygen, toxic and combustible gases and vapors are necessary. FLEXIBILITY THROUGH SENSOR VARIETY The extensive portfolio of over 25 different DrägerSensors enables the detection of more than 100 gases and vapors. The Dräger X-am 7000 can be equipped with three electrochemical, and two catalytic bead, infrared or photo ionization sensors. During operation, it is also possible with the catalytic-Ex sensor to change the gas being measuring or the measurement range of the sensor. In this way, the instrument can be easily adapted to various applications. DrägerSensors are renowned for their fast response time, minor cross sensitivities, high level of accuracy and long lifetimes. POISON RESISTANT EX-SENSOR Advanced safety in explosive atmospheres: thanks to the high sensitivity of the innovative Ex-sensor to combustible organic vapors the Dräger X-am 7000 warns reliable of danger of explosions. It not only responds quickly to combustible gases and vapours, it is also characterised by its high resistance against silicone and hydrogen sulphide contamination. In combination with the high degree of drift stability, this resistance enables an extraordinarily long service life of more than four years. This will reduce your operational costs. ROBUST AND WATERTIGHT A specially designed rubber boot protects the instrument against damage even from a drop of 1.5 m or 5 ft. In addition to the bulit in dust and water filter, the Dräger X-am 7000 can be submersed in up to 1m or 3 ft. of water without damage. STRONG INTEGRATED PUMP The built-in high-performance pump makes it possible to sample gas using a hose up to 45 m/150 ft. long. The operation of the pump is continuously monitored, and the instrument will generate an alarm if the flow of gas reduces. 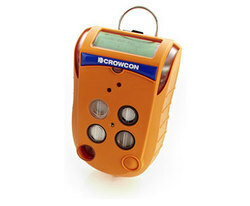 Multi Gas detector from Crowcon, consists of target gas Oxygen(O2), Hydrogen Sulphide(H2S), Flammable gas, Carbon Monoxide(CO). Applications: Steelworks, Petrochemical plant, Shipbuilding yard, Sewage treatment plant, Mine, Power supply works, Hermetically sealed area (manhole, tank). 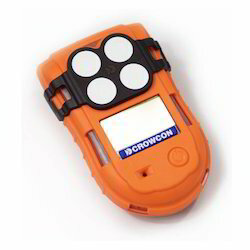 Crowcon T4 Multi Gas Detector integrates innovative safety features and an intuitive, rugged design to provide advanced protection for those working in harsh environments. 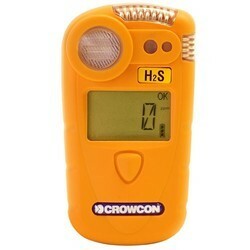 This portable multi gas detector, which is exceptionally easy to use and service, protects against the four most prevalent gas hazardous: carbon monoxide (CO), hydrogen sulphide(H2S), flammable gases and oxygen (O2) depletion. Dräger Pac 7000 Single-Gas Detection Device is Safety at the workplace always takes priority: depending on the sensor selection, the single gas detector, Dräger Pac® 7000, provides a reliable warning against dangerous concentrations of 14 different gases. 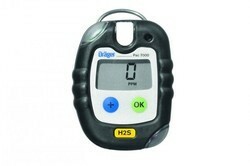 Unique: the optional 5-year warranty for the H2S, O2 and CO versions. Dräger Pac® 7000 Warns against hazardous gas concentrations Every working day places the highest demands on gas monitoring. The device reliably warns against hazardous concentrations of carbon monoxide, hydrogen sulphide (including a Low Concentration option), oxygen, carbon dioxide, sulphur dioxide, chlorine, hydrogen cyanide, ammonia, nitrogen dioxide, nitrogen monoxide, phosphine and organic vapours. Protective rubber ensures that the casing of the Dräger Pac 7000 is particularly shock-proof. 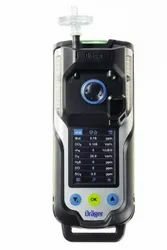 The device meets the strict dust and water protection requirements specified in IP 68. The electromagnetic resistance has also been optimised. Dräger has designed the Dräger Pac 7000 for unlimited lifetime. When needed, the sensors can be simply replaced. The bump test mode and sensitivity calibration can be selected via a password-protected menu. The fresh air calibration can be optimally protected using a password. The device is equipped with an infrared interface and can be connected to a PC via a communication cradle in order to activate the desired functions or download stored data. The innovative Dräger XXS sensors react quickly and produce reliable measurement results. Very short diffusion paths inside the device, as well as the sensors' rapid electrochemical reactions, ensure that any gasrelated dangers are displayed as soon as they occur. For maximum safety, the sensor is positioned inside the housing such as to allow gas to reach it from above and from the front. This guarantees flawless measurement, even when the gas entry has been accidentally obstructed. 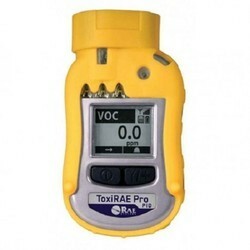 ToxiRAE Pro PID VOC Monitor: is a portable photoionization detector. Featuring RAE Systems' next-generation PID sensor, the ToxiRAE Pro PID can promptly detect and accurately monitor over 300 VOCs. With an onboard library of 190 correction factors, the ToxiRAE Pro PID can be programmed to automatically read in concentrations of the specified compound. The ToxiRAE Pro PID is offered in Industrial Hygiene (advanced) and Safety (basic) configurations. ToxiRAE Pro PID boasts intelligent interchangeable sensors, continuous data logging functionality, Man Down alarm and policy enforcement functionalities, the largest backlit display in its class, and an unmistakable five-way alarm notification system that immediately alerts both the user and a remote observer of a hazardous condition by activating the buzzer, vibration alarm, display, and LED lights on the instrument. Gas-Pro PID and Gas-Pro IR offers detection of up to 5 gases in a compact and rugged solution, and detects a number of Volatile Organic Compounds. These organic compounds are characterised by their tendency to evaporate easily at room temperature. Familiar substances containing VOCs include solvents, paint thinners and glues, as well as the vapours associated with fuels such as gasoline, diesel, heating oil, kerosene and jet fuel. Gas-Pro IR provides rapid detection of explosive gases where conventional pellistor sensors may not be suitable, especially in low oxygen environments such as storage tanks purged with an inert gas. In IR sensors, gas is measured using two different wavelengths: one that absorbs gas and the other that does not. This allows for easy measurement and high sensitivity to gases. Unlike pellistor sensors, IR sensors are resistant to silicon poisoning and require less frequent maintenance and calibration. 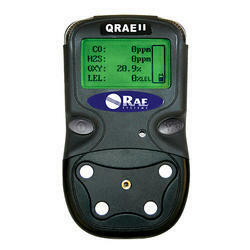 Gas-Pro IR measures the %LEL limit of 3 common flammable gases: methane, pentane and propane. With an increased focus on regular bump testing of gas detection through regulation and individual company requirements, bump testing has become even more important. 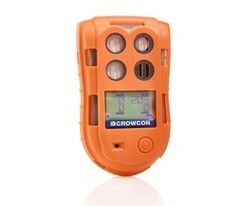 Crowcon offer bump test solutions with I-Test and Q-test. I-Test offers a full bump and calibration system, which is easy to use and records the results of the test. With I-Test Manager you can run reports and look at the data that has been collected through the I-Test system making your site fully compliant. Calibration and Bump certificates can be printed easily at a few clicks of a button. Ideal for large fleet users, the I-Test will look after a fleet of hundreds of detectors making your life easier. The Q-Test requires no power and is therefore ideally suited to remote users. Crews can now complete their functional check immediately prior to entry ensuring they are compliant. The power-enabled option allows users to charge Gas-Pro on the move. Multiple mounting options and cylinder holder will ensure that Gas-Pro is ready to protect workers when needed. Gas-Pro offers detection of up to 5 gases in a compact and rugged solution capable of withstanding harsh environments and everyday use. Gas-Pro has an easy-to-read top mount display combining ease of use with user focused features. An optional internal pump, activated with the flow plate, takes the pain out of pre-entry testing and allows Gas-Pro to be worn either in pumped or diffusion modes. XNXSensePoint LEL(0-100% LEL):is an extremely flexible transmitter that can be configured to accept an input from any of the Honeywell Analytics range of gas sensor technologies. It can also be configured to provide a wide variety of industry standard output signals. This enables users to have a single type of interface to all their gas detection needs, even when different types of detectors are employed, to most effectively address the different gas detection applications on site. 1. Combustible gases are monitored with catalytic bead sensors. 2. Hydrogen sulfide (or sulfur dioxide) and carbon monoxide are monitored with electrochemical sensors. 3. Oxygen is monitored with a solid polymer electrolyte (SPE) sensor. Lightweight and Compact : 9 oz (250 g) diffusion model, 12 oz (350 g), pump version, handheld size. QRAE II diffusion model : 14 hours of monitoring with microcontroller. Programmable Alarm Thresholds : Audio buzzer and flashing display alarm. 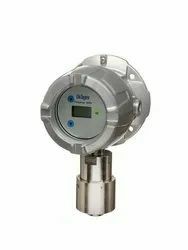 Drager make Multi Gas Monitor instrument for up to 5 gases, developed especially for personal monitoring applications. 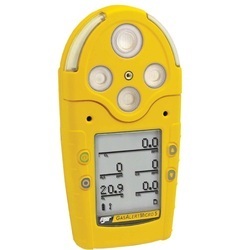 Multi Gas Monitor measures combustible gases and vapours as well as oxygen and harmful concentrations of CO, H2S, CO2, Cl2, HCN, NH3, NO2, PH3 and SO2. A variety of special calibrations for the catalytic Ex sensor allow even more sensitivity when detecting specific combustible gases and vapours. Maximum hose length 30 m; 98 ft.
9V, NEDA 1604A or IEC 6LR61, or equivalent. T4 integrates innovative safety features and an intuitive, rugged design to provide advanced protection for those working in harsh environments. 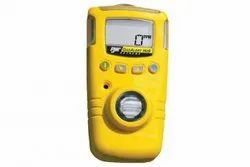 This portable multigas detector, which is exceptionally easy to use and service, protects against the four most prevalent gas hazards: carbon monoxide (CO), hydrogen sulphide (H2 S), flammable gases and oxygen (O2 ) depletion. 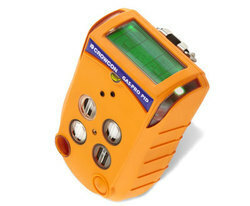 T4 Portable Multigas Detector. TWA Resume function Unique to T4, this innovative feature ensures toxic gas exposure is calculated accurately over an entire shift, even if T4 is switched off for a break or during travel to another site. 18 hour battery life Safely work multiple or longer shifts between charges, covered by the 18 hour battery life. Backlight display Large, clear display with backlight and option to flip the screen 180° for easy viewing whilst worn. 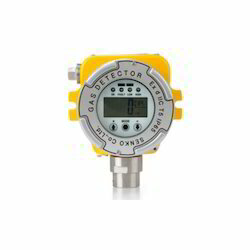 Dedicated sensors One sensor for every gas ensures effective, fast and reliable detection. Multiple alarms Audible 95dB alarm, bright red/blue LED’s and vibrating alerts provide effective warning to gas hazards. Easy operation Large single button and intuitive menu system minimise training and allow easy operation whilst wearing gloves. Gasman is a range of rugged, compact single gas personal monitors designed for use in the toughest environments. With rugged impact resistant construction and compliance to IP65, Gasman offers a wide range of gases, including six flammable calibration options. Gasman gives an unbeatable combination of powerful loud and bright alarms. It’s stunningly compact and lightweight design makes it ideal for use in industries such as oil and gas, chemical, steel works and waste and water works. Gasman is small, light and easy to use. Weighing just 130g, it is extremely durable, with high impact resistance and dust/water ingress protection to IP65. When potentially hazardous levels of gas are detected, the Gasman alerts the user with a loud 95 dB alarm, a vivid red/blue visual warning and also by vibrating. 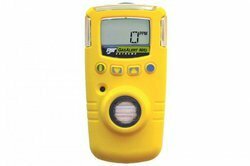 Gasman features simple, single-button control and has an easy-to-read, backlit LCD display to ensure clear viewing of gas level readings, alarm conditions and battery life. Data and event logging are available as standard, and there is a built-in 30 day advance warning when calibration is due. 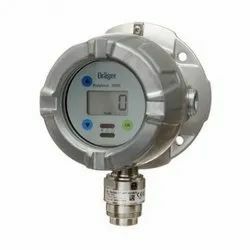 Drager Pac® 7000 Warns against hazardous gas concentrations Every working day places the highest demands on gas monitoring. The device reliably warns against hazardous concentrations of carbon monoxide, hydrogen sulphide (including a Low Concentration option), oxygen, carbon dioxide, sulphur dioxide, chlorine, hydrogen cyanide, ammonia, nitrogen dioxide, nitrogen monoxide, phosphine and organic vapours. Robust and long-lasting Protective rubber ensures that the casing of the Dräger Pac 7000 is particularly shock-proof. The device meets the strict dust and water protection requirements specified in IP 68. The electromagnetic resistance has also been optimised. 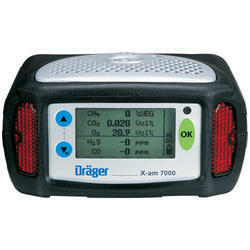 Dräger has designed the Dräger Pac 7000 for unlimited lifetime. When needed, the sensors can be simply replaced. Simple calibration and configuration The bump test mode and sensitivity calibration can be selected via a password-protected menu. The fresh air calibration can be optimally protected using a password. The device is equipped with an infrared interface and can be connected to a PC via a communication cradle in order to activate the desired functions or download stored data. Innovative miniature sensors The innovative Dräger XXS sensors react quickly and produce reliable measurement results. Very short diffusion paths inside the device, as well as the sensors' rapid electrochemical reactions, ensure that any gasrelated dangers are displayed as soon as they occur. For maximum safety, the sensor is positioned inside the housing such as to allow gas to reach it from above and from the front. This guarantees flawless measurement, even when the gas entry has been accidentally obstructed. Fast bump tests with the Dräger Bump Test Station To perform an automatic function test with a known gas concentration within a matter of seconds, the device is simply inserted into the Dräger Bump Test Station. The display informs the user if the bump test (function test) was successful. If the test is not performed within a certain time frame, the device can be set-up to deactivate itself. Triple alarm for extra safety As soon as the adjustable alarm thresholds are exceeded, or values fall below the configured oxygen concentration, the Dräger Pac 7000 immediately issues an audible, visual and vibrating alarm. In addition, the device is also equipped with adjustable TWA and STEL alarms. The user is also warned when the battery is low or a functional error has occurred. 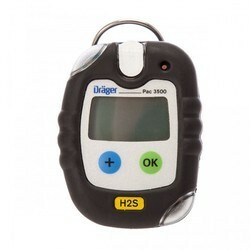 Dräger Pac 3500 Single-Gas Detection Device Fast and reliable, accurate and maintenance-free for up to 2 years: Drager Pac 3500 is ideal for the industrial personal monitoring of carbon monoxide, hydrogen sulphide or oxygen. 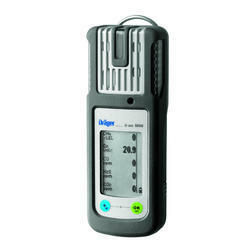 Compact and robust The Dräger Pac 3500 is light-weight and compact, offering excellent wear comfort. The stable, rotatable crocodile clip allows it to be securely and safely attached to clothing or belts. The device features a shockproof, chemical-resistant rubber coating and meets the requirements of IP68. It is, therefore, very suitable for rough working environments. Safety in any situation: The Dräger Pac 3500 is equipped with the Dräger XXS sensor. It has been carefully positioned to allow gas intake from both the top and the front of the device. Even if a gas inlet is accidentally been covered, a continous measurement is guaranteed. Triple alarm With the Drager Pac 3500, no alarm goes unnoticed: alongside a clearly audible, multi-tone signal and a visual alarm in the form of a bright, flashing 360-degree LED on the top and bottom of the device, it is also equipped with a vibrating alarm. Event logger The Dräger Pac 3500 can store up to 60 events, along with their dates and times. An infrared interface allows them to be loaded onto the PC, where they can then be used for further analysis. Tocsin 102 PhotoIonisation Gas Detector for VOC’s further enhances the products capabilities. Tocsin 102 PID has excellent dynamic response now to over 400 gases and vapours. 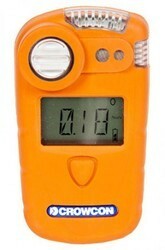 As a fixed gas detector this represents and unparalleled first response capability. Photo-Ionisation detectors offer many advantages for VOC detection over other available technologies. Ranges of measurement are possible from Parts Per Billion (ppb) to high Parts Per Million (ppm) ranges dependant on the gas or vapour being monitored. Tocsin 102 Photo-Ionisation detectors offer many advantages for VOC detection over other available technologies. Ranges of measurement are possible from Parts Per Billion (ppb) to high Parts Per Million (ppm) ranges dependant on the gas or vapour being monitored. Sensepoint XCD RFD (Remote Flammable Detector) has been specifically designed for use with remotely mounted flammable gas sensors. This configuration is ideal for applications where the sensor is required to be mounted remotely from the transmitter in areas where temperatures are well above ambient (up to 150°C/302°F), or that are difficult to access. The transmitter can be mounted at a suitable location away from this area where it is easy to access, view its display and interact with via the user interface. 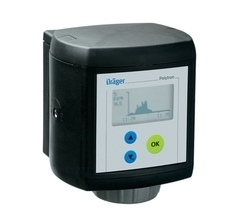 Dräger Polytron 7000 is a gas detector that can satisfy all toxic and oxygen gas measurement applications on a single platform. It is meeting the requirements of the compliance market as well as the high specification requirements of customized solutions. 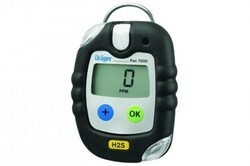 Dräger Polytron 7000 can detect over 100 different gases. Dräger Sensors are specifically designed for the demands of 24 hours per day, 365 days per year operation.Its wide range of outputs, 4 to 20 mA, HART®, LON, PROFIBUS® or FOUNDATION Fieldbus™, enables the use of the Polytron 7000 on either a control system from the Dräger Regard family, or third party control systems. The modular design allows for the subsequent retrofit onto any of the mentioned interfaces. 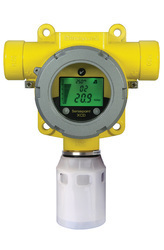 Hydrogen Sulfide Fixed gas detector from Senko SI-100 , installed in a place where potential gas hazard exists to measure oxygen, toxic gas and combustible gas. It shows not only the concentration of gas but also diagnostic result of the unit itself through the LCD display and can be connected to the controller with a standard 4-20mA analog output communication or RS-485 digital communication. Applications: Steelworks, petrochemical, refining, shipbuilding, wastewater treatment plants and septic, mining, power, agency. 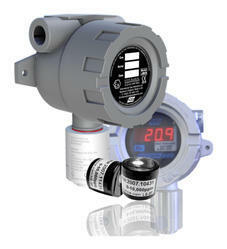 Warns against hazardous gas concentrations Every working day places the highest demands on gas monitoring. The device reliably warns against hazardous concentrations of carbon monoxide, hydrogen sulphide (including a Low Concentration option), oxygen, carbon dioxide, sulphur dioxide, chlorine, hydrogen cyanide, ammonia, nitrogen dioxide, nitrogen monoxide, phosphine and organic vapours. 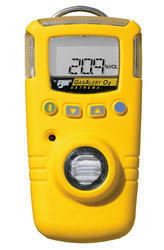 Looking for Gas Detectors ?